When Ohio state legislators passed HB487 in 2014, their intention was to increase flexibility, strengthen the rigor of high school examinations and provide more opportunities for learners to graduate ready for careers. Among other reforms, the bill formalized three pathways to graduation that would go into effect for the graduating class of 2018 (those students starting grade 12 this fall). These pathways include earning a remediation-free score on a college entrance examination, earning a cumulative passing score on seven end-of-course exams, or earning certain state-approved industry-recognized credentials. But when local superintendents raised concerns about the policy earlier this year, state policymakers made critical last-minute changes and adopted additional graduation options. The concern was largely rooted in the idea that new end-of-course examinations were more difficult than previous versions and that many students would fall short of the full points needed to earn a diploma. Local leaders worried that the state graduation rate would fall by as much as a third under the new requirements. receipt of an Ohio Means Jobs readiness seal. An additional pathway allows students to earn a diploma by completing end-of-course examinations, finishing at least four courses in a state approved CTE program of study, and either earning a proficient score on technical skill assessments, earning an industry-recognized credential or completing 250 hours of work-based learning. While these changes only apply to the graduation class of 2018, the state hopes to develop a long-term solution soon. 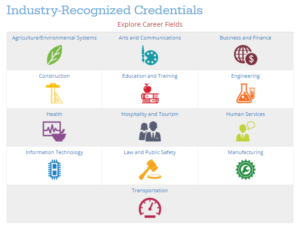 Meanwhile, the Ohio Department of Education expanded options for students on the credential graduation pathway by adopting 49 new industry-recognized credentials. The current list spans 13 career fields ranging from health to hospitality and tourism. To be added to the list, credentials must either be aligned with in-demand occupations in Ohio or be submitted for consideration by members of the public. To help learners take full advantage of the industry-recognized credential pathway and cross the finish line with credentials in hand, Ohio is also implementing a senior only credential program. The program is designed to help high school seniors who have met most of their graduation requirements round out their senior year and graduate career ready. Participating students can choose from several credentials — such as the National Association of Veterinary Technicians in America Approved Veterinary Assistant credential or the American Medical Certification Association Phlebotomy Technician Certification — that can be earned within a year or less. The senior year credential program is a key piece of Ohio’s career readiness strategy under the New Skills for Youth initiative. To address a growing skills gap and equip learners with credentials to meet the demand of tomorrow’s workforce, Indiana Gov. Holcomb announced the Next Level Jobs Initiative. The initiative includes the Workforce Ready Grant — authorized by the legislature earlier this year — and the Employer Training Grant program, totalling more than $20 million over the next two years. The Utah State Board of Education removed a requirement that middle school students take classes in physical education, health, the arts, and college and career readiness. The decision was designed to provide local education agencies more flexibility to set their own course requirements. While all classes must be offered, districts can choose to integrate courses as long as the core standards in each course are taught. Meanwhile, several states have released updated or final versions of their Every Student Succeeds Act (ESSA) implementation plans for public comment — including Wyoming, which submitted a plan to the U.S. Department of Education one month early. Read Advance CTE’s latest commentary on ESSA implementation here.